Telegraph journalist Sam J Dean claims he noticed Arsenal manager Unai Emery giving Petr Cech ‘an earful’ against West Ham. Supposedly, the Czech Republic goalkeeper lumped the ball long instead of playing out from the back, as has become increasingly fashionable as a tactical trend in recent times. 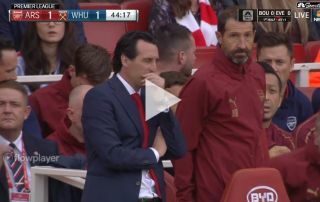 Emery is known to be a demanding coach with intense training sessions and a vocal nature on the touchline, and it seems he wasn’t at all happy with Cech’s decision-making here. Not much more detail is known about what Emery might’ve said to the player, but Cech will certainly want to be careful. This is because Arsenal did in fact sign a new goalkeeper this summer, bringing in Bernd Leno from Bayer Leverkusen. It initially seemed like the German shot-stopper would be number one for the Gunners, but it hasn’t worked out that way so far. If Cech doesn’t play the Emery way then it might not be too long before Leno gets the nod between the sticks.